This morning Whisky seemed very preoccupied with something in the hedge. It turned out to be what I think is a Common Indian toad (Duttaphrynus melanostictus). 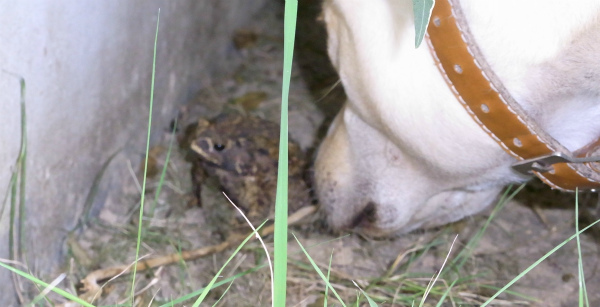 The toad could hop around through the undergrowth faster than Whisky could navigate around, so the toad was pretty safe, though I sent Whisky inside to give it a chance to escape. After all, he is a fearless frog warrior and he might have got lucky.